For safe, durable, and quality blades that don't dull easily, Knife line is your ticket to cooking with ease. For food preparation at home or in the commercial restaurant kitchen, the 4.5-Inch Steak Knife offers sharp blades and sturdy grip for all of your food preparation needs. Easy-to-use and durable, this Stainless Steel knife is made with tarnish-free and rust-resistant Stainless Steel that will stay sharp through many uses. 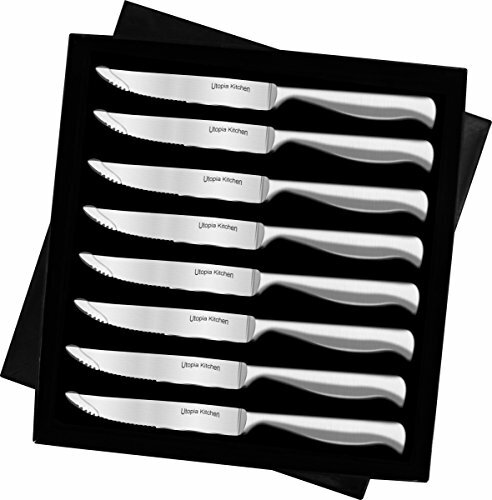 8 Pieces Stainless-Steel Kitchen Steak Knife. Comfortable grip for easy maneuvering. Cut Easily Through A Variety Food Items. NOTE: Please hand clean and don't use dish washer. You can easily remove rare rust spots if dish washer is used by pouring some lemon juice into a tall glass, and then soak the knives in the lemon juice for a few minutes. The acid in the lemon juice should help to loosen up the rust, and make it easier to scrub away after you pull them out of the glass (Hand-wash is highly recommended).